No matter how dedicated and responsible you are as a hermit crab owner, you might face the possibility that your new pet could die after only a few weeks or months in your home. Handling the death of a hermit crab can be hard for a child who has grown attached to his new pet. You can avoid disappointment by following a few guidelines to ensure the crab you pick is as healthy as possible. Look for crabs that are active. A crab who walks around his cage is more likely to be healthy than a crab who stays in one spot and barely moves. Choose a hermit crab who's in his natural shell. 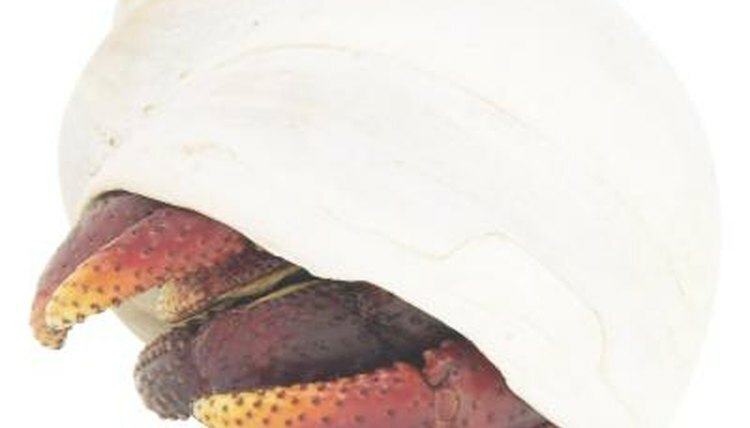 The Hermit Crab Association notes that crabs who live in their natural shells are usually in better health than crabs forced into painted shells. Eliminate crabs who are out of their shells, even if they haven’t left them completely. Being without a shell is stressful for a hermit crab, and moving the crab to a new cage can increase stress. Count the crab’s legs. Pick a crab with all of his legs. Missing legs could be a sign that the hermit crab is stressed. Smell the crab. If he has a musty smell, he may be molting, which happens when the crab grows a new exterior skeleton. While molting is a natural process, a crab who is molting is more stressed and might be more likely to die if you take him home. A musty smell can also be a sign of a fungal infection or an overly warm cage. Pick two crabs. Hermit crabs are social creatures who live happier lives in the company of other crabs.  Look for mites when choosing a hermit crab. Mites are tiny brown or gray bugs that live in a crab’s shell and cage and can eventually kill a crab. Bring the cage into the sun if you can. Mites don’t like bright light and will quickly look for hiding places if you expose them to the sun. You might spot them when they move toward darker places in the cage. ⚠ Don’t forget to ask questions at the store. If you’ve never had a hermit crab, find out how many hermit crabs can safely live in one cage, what your crab should eat and at what temperature you should keep the environment. Understanding your hermit crab’s needs will help raise the odds that he'll enjoy a long and healthy life.